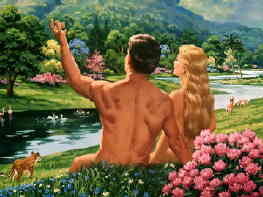 God must have told Adam and Eve many things in his special evening talks. How much God told Adam and Eve about sin or Satan is unknown. But, God did give them a test of obedience and love. God had given Adam and Eve everything that was needed for health, happiness and fulfillment. The "Tree of Life" gave something special that allowed Adam and Eve to live forever, as long as they ate it. God also placed another tree in the Garden: the "Tree of the Knowledge of Good and Evil". But, God warned Adam and Even never to touch the tree or to eat it’s fruit. In fact, to prevent temptation, they were not to go near the tree! Eating, or not eating fruit from the tree, was God’s special test of man's love, loyalty and obedience to the Creator! This forbidden tree was the only place in the world where Satan could tempt man. Eve took some of the fruit and ate it. Eve felt so good about eating the fruit that she persuaded Adam to eat the fruit, too. Suddenly, the world had changed. Mankind had disobeyed God and failed the test. Sin had entered the world. 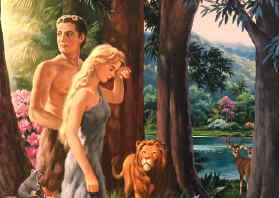 Adam and Eve were afraid of God.. Adam and Eve were no longer innocent and filled with love. Selfishness began to rule their lives. Satan became the new ruler of the world. That night when God again came to visit Adam and Eve, they were hiding. Adam and Eve must have had a long and sad visit with God. God assured them that He still loved them dearly. To help them get an idea of the terrible result of their sin, God killed an animal. God had said if Adam and Eve ate from the forbidden tree, they would die. The killed animal symbolized a Saviour who some day would come and die for them. God explained that now they must also kill a lamb and confess their sins over the animals head. Adam and Eve must offer the innocent lamb as a sacrifice in faith pointing to a Saviour (Jesus) dying personally for their sins! Jesus would come as a child, and live with mankind. Jesus would live a pure sinless life, an example of what God can do for man. Then, Jesus would die on a cross for man. Jesus would die instead of man. He would pay the death penalty for man. [John 3:16] But to receive the pardon, man must be willing to accept God again as ruler of his life. Then God would send His Holy Spirit to live in man. 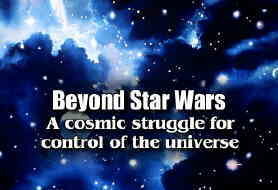 Man, combined with the Divine Spirit, could then live a life of love and obedience. This Good News must have cheered Adam and Eve as they received the terrible news that they must leave their beautiful Garden home. Now thorns and thistles would make their life harder. Man would live by the "sweat of his brow". God put an angel to guard the entrance to the Garden. No longer could they eat from the Tree of Life and continue a sinful life forever. The process of death had now begun . After a time they would die. It must have been with heavy hearts that Adam and Even made a new home outside the Garden. Go to the Next Section: God's Plan for Man Has to be Changed. Find out how God had to change plans.